�����Dr. David Banner, physician, scientist, searching for a way to tap into the hidden strengths that all humans have. Then, an accidental overdose of gamma-radiation alters his body chemistry. Now when David Banner grows angry or outraged, a startling metamorphosis occurs. The Creature is driven by rage and pursued by an investigative reporter. The creature is wanted for a murder he didn't commit. David Banner is believed to be dead and he must let the world think that he is dead until he can find a way to control the raging spirit that dwells within him. --From the Genesis Incredible Hulk instruction manual. Dr. Robert Bruce Banner munched some bad drugs and the next thing you know, he is a Green, Mean, fighting psychopath (bet you thought I was going to say machine). Fortunately, he is defending us against evil meanies intent on taking over the world. No, not Halliburton, but aliens from another planet. That or idiots dressed up in aluminum foil. The Incredible Hulk tries to stump a space alien into toe jam and you not only hear it, but with your speakers turned up, you can almost feel it. The sounds of the game should make any gamer, who hasnt been deafened by his favorite KISS album, happy. You hear space rays whizzing everywhere, the Hulk roaring in indignation and the throaty sound of missile launchings. Incredible Hulk has incredibly detailed graphics; even showing rivets and rust on structural beams. Although 2D, it has a pseudo 3D effect. The combat should make gamers happy with an endless supply of villains to fight. And remember, even if you don't want to save the Earth, you are the Hulk and you can do more damage to a city block than ten mayors. Every level brings deadlier aliens, so flex those muscles and destroy! The Incredible Hulk is not likely to win a Nobel Prize, so just imagine what you would do if you were a moron with a second dose of stupidity added in. Kill everything that moves. Dont discriminate. 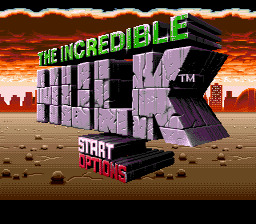 The Hulk has a mission to save the Earth from invading Aliens. What could be more noble than sacrificing yourself for a bunch of worthless nobodies that you don't even know? And remember, those smart aliens are probably laughing at you.